A few weeks ago I read this article entitled I Used to Sit Next to You, By Emily Reis. The Article is from September 24th, 2012, but I only got around to reading it in the last few weeks. When I read this article I thought, man that has been my life. 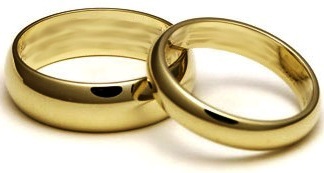 I can remember the days before and right after we got married and how we used to sit in Mass and hold hands. Now, over the last 15 (Updated: 21) years, the space between us has just gotten further and further apart. Believe me the space between us has grown but every inch has been worth it. Now, I love little kids. Usually if you see me at a function with families, you can tell it’s me because I have a little one in my arms. But one thing about little kids is that they just don’t get going to Mass. In my experience there is nothing you can do for a 2 year old that will help them understand that going to Mass is the greatest part of the week. You can tell a 3 year old over and over again, there up on the Altar, is God. You have to be quiet now. They won’t believe you, and will continue making truck noises. The 4 year old might begin to grasp the concept that they should be quiet but, to them an hour feels like forever. The 5 year old who has finally managed to stay quiet through the Homily, will be over joyed by the fact that you are getting up and moving toward the end of the pew, only to be utterly disappointed when it turns out you’re just going up for communion. All these things are true, and there is nothing you can do about it. So you might as well get used to it. Though I love them dearly, they have all driven me crazy during Mass. 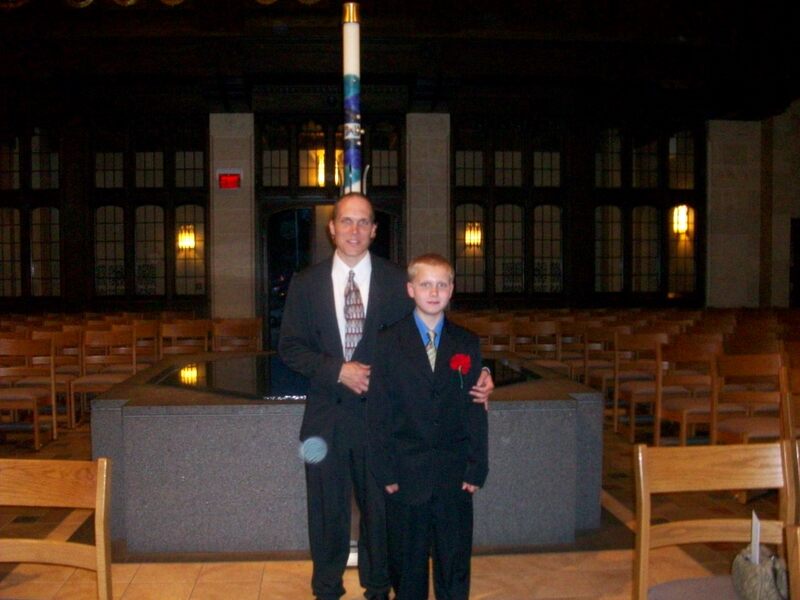 From the time when we only had one of them until now (and we now have 9)(update: 13 now), we have always had trouble with the kids during Mass. For those of you shaking your head and thinking, “man I can’t handle 2 in Mass how do they handle 9,” we are not super heroes. Well I am not a super hero. I think my wife might be, as she has been known to take all the kids to Mass by herself, when I am traveling. But super hero or no, it is really just about prospective. We had just as much trouble with two as you probably are. Over the years we have had to deal with sitting further and further apart on the pew. Heck, there were times when I saw my wife at the beginning of Mass, again during communion as one or the other of us passed by the pew from the back of Church, and again after the last hymn. But it is not all bad news, it does get better. As I said it does get better. We have two or three older kids now who can help us during Mass. They can hold the baby (2 now) and sit next to the 4 or 5 year old and usually help to keep them quiet. It does not always work and my wife and I still spend a fair amount of time holding, shushing, threatening, soothing and taking little ones out of Mass. But it is getting better. In the last year the number of times we have been able to sit next to each other has gotten big enough that I need my fingers and toes to count. And I can now remember those times when we were younger and we were the ones watching the families wondering when we were going to be at that point. The problem is that it is bitter sweet. 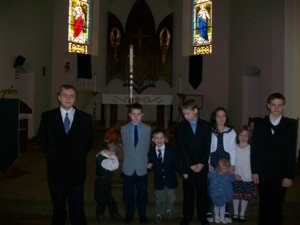 My oldest four sons are Altar servers. When I see them up on the Altar before Mass in just the black Cassock as they set things up or light the candles, I see the men that they are rapidly becoming. When I watch them serve the Mass and kneeling before God, I know that they know how important the Mass is. I see my eldest daughter and her brother who are finally tall enough that I don’t have to stand right behind them in the Communion line to tell the priest “Yes, they can receive.” I know that they are all growing up. I am a sentimental sap, I know. Having said that, I do like being able to sit next to my wife again. It is nice to be able to share a look during a reading or a quick squeeze of the hand when the Homily strikes home. Heck, the fact that we can hold hands again is pretty darn amazing. But, you ask how did we make it through? How did we keep going to Mass when we felt like we needed to go to confession every time we went to Mass? You are probably not going to like the answer, because it is not all puppies and rainbows. Strong faith is probably not going to be enough. Again, I can only speak from my experiences here. You can have incredible faith and still feel like a failure. You can feel like you are letting everyone else in Mass (including the priest) down by not managing to keep your kids quiet, or preventing them from grinding Cheerios into the carpet. You can feel like you should not be there when the guy in front of you turns around and not so politely asks you if you can keep the kids quiet. You can wonder why you even came to Mass when the older lady from the back of the church reminds you that they do have a cry room. You might wonder what the point is as you sit in the cry room (full of toys) and can’t quite hear the readings over the tiny cracked speaker. Why even leave the house when it is a struggle to get the two year old’s shoes on and by the time you get to Mass you have already told the older kids, “No we will not be staying for doughnuts after Mass because you didn’t behave.” Strong faith may not be enough to get you through these times. You are going to need help. I would love to tell you that all priests are understanding and that all the old ladies in church will be like grandmothers and all other parents will understand. The truth is that none of these are true. The good news, I mean other than The Good News, is that there are good priests who understand, and there are grandmothers in church who will help, and there are parents in church who understand. The trick is finding them. The trick is finding a support group, and a good parish, and to spend time talking to your priest. Great Priests will understand that kids are the future of the Church, and will some times even make it a point to tell other people the same thing. 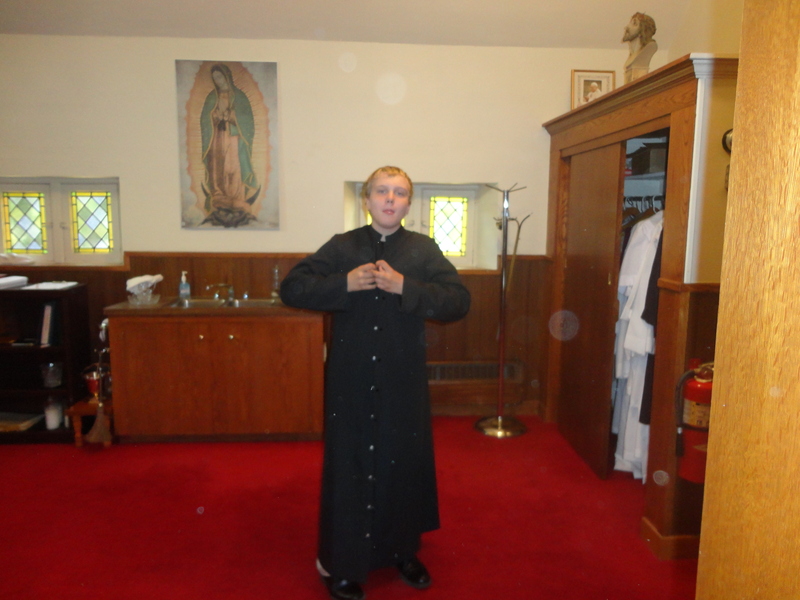 I truly believe that most priests are great priests, but some times they forget. A gentle reminder is sometimes in order. This is true for all of us. Most important, (and this one is sometimes hard to remember when you are sitting on opposite ends of the pew feeling guilty for even being there) remember that you and your wife are a team, working toward the same goal. Heaven, and of course that spot in the center of the pew where you can sit close enough to hold hands. One of our old priests (a really great priest by the way) used to say that we did a great job juggling the kids during Mass. I was never sure if that was good or bad. And I always had images of kids being tossed in the air when he said it. So you might ask what works? Again, these are things that have helped us. My wife and I are pretty darn independent, and we have discovered that we will do things that other people just won’t. So these might not work for you. Also we don’t have any family that live around us that can help, so we have learned to do things mostly on our own. Obviously spliting the kids up will have some effect, but if you have more than three kids this is not always effective. If the kids will behave better for someone else ask a friend to take one of the kids. This only works if the kids will be better with someone else, if they are just going to misbehave with someone else then there is no point. Going to Mass together. This is not intuitive because you might think splitting up might be a good idea, but going together shows the kids that you and mom are a united front. They are not going to get out of going to Mass by misbehaving. Don’t sit on top of each other. (I make this mistake all the time.) As a large family it can be hard to find a pew that will seat all of us. Don’t be tempted to squeeze into a pew that would not normally fit you all. Sometimes too much family togetherness really is, too much family togetherness and you will all be on each others nerves before the Homily even starts. Don’t bring toys to Mass. Empty the pew of books, prayer guides and especially those little pencils. Again, this might not sound like it makes sense, but those are distractions. They will distract the kids, the older and the younger ones and will in turn distract you and those around you. Don’t use the cry room unless you actually have a crying kid. It might be tempting to start Mass in there and just camp out. But, especially when you are talking about a 4 / 5 / 6 Year old, it should be like time out, a place where you go when they are misbehaving, until you have it under control then head back to your pew. I really don’t like to make lists like this because it makes people think that I really know what I am talking about. I don’t! Far from it. We have felt our way along, we have failed miserably in some places and in a few cases even succeeded. I think. There is a bright ray of sunshine for all of you who can commiserate with the “I Used to Sit Next to You” article. Your kids will grow, they will learn to behave during Mass. It might not be easy to hear that from where you are right now. Just knowing that there is a light at the end of the tunnel might not be enough. You might fear that light is an oncoming train. But there is a light, and there are other people who understand. Don’t be afraid to reach out. For those of you saying, “been there, done that.” Remember next time you are in Mass and the kids behind you are squirming too much, remember that you have been there, and you have done that. When you see the mother or father trying to hold three kids, don’t frown and wonder what they were thinking, or question the way they are trying to handle the little one. instead quietly ask if you can help, and don’t be pushy if they say no. If you see the priest frowning at the parents with the kids who are grinding Cheerios into the carpet, remind the priest that without that kid, the Church has no future, and don’t be afraid to ask him where the vacuum is. Oh and one last thing. Always bring extra tissues to Mass with you. I always forget (I think most dads do) and at least one of the kids usually needs one. Trust me, I will always welcome the proffered tissue. And if I forget to say it then, Thank you. Previous Palm Sunday – Thoughts on a Homily that didn’t Happen. I completely understand! My husband and I are just now able to sit together in Mass,and although the children can still be very distracting, we try to enjoy Mass as a couple. The simple act of holding hands during the homily can be a truly beautiful, bonding experience. I am glad you liked the post. It was actually a lot of fun to write. Thanks.